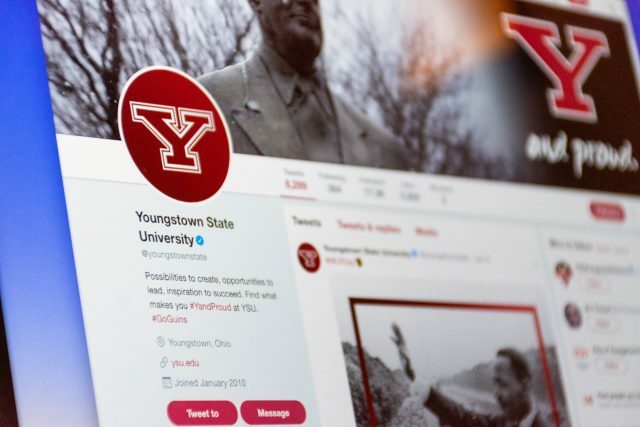 Youngstown State University’s social media accounts came out on top during a nationwide report by Rival IQ and Up & Up Agency. The report looked at over 300 NCAA Division I universities in the U.S. and ranked their Facebook, Twitter and Instagram pages based on a combination of page engagements, views, followers and other analytics. Overall, YSU ranked third in Ohio and 173 in the U.S., but earned the highest marks on Twitter with a ranking of 61 in the U.S. and second in Ohio. Kati Hartwig, coordinator of social media and digital marketing and two-time YSU alumnus, is the university’s first full-time employee whose job is solely dedicated to social media. Hartwig said the students are what set YSU’s social media apart from the rest. “[YSU’s social media has] evolved so much and really [followers] can tell the personality of the student body based off how the students are interacting with [YSU’s] social media each year,” she said. Hartwig has recently focused the university’s social media on user-generated content, such as sharing submitted photos. Through Instagram’s question and answer feature, YSU’s account will ask followers for suggestions on campus related topics such as their favorite place on campus and advice for freshman. In the next year, YSU’s social media team hopes to have more posts that spark conversations and questions or take part in campus activities in different way, such as through video. “We are always looking for ways to change it up,” Hartwig said. Adam Earnheardt, chair of the department of communications and social media critic, believes YSU’s social media takes a lot of time to be engaging with followers. Earnheardt said he thinks in the last five years YSU’s social media has become more active on platforms used by traditional college-age students: Snapchat and Instagram. According to Earnheardt, social media is one of the biggest channels that YSU or any university has to reach students or potential students, and he praised YSU’s social media staff for their ability to tastefully take pop culture references and memes to engage with followers. Lexi Timko, a senior communications major and social media assistant for YSU, explained that with personal social media, users “do what they want” as far as content, whereas YSU’s social media is more focused on what the audience wants. Timko said she credits the university’s social media success to Hartwig. “[Hartwig] being so involved is what connects our audience with the university. She does such an amazing job. I just feel she really connects with our students here at YSU,” she said. Since Timko’s time as a social media assistant, she has learned tactics to change profile theming and aesthetic, partaking in conferences and works to coming up with new ideas to evolve YSU’s social media. “We want to tell the story of our university and show what we value through our posts,” she said. According to Hartwig, YSU’s social media strives to allow its followers have a say and make them feel as though they are a part of YSU whether they are an alumnus, community member, student, faculty or staff member. “With social media [society] always wants to feel like [they] are a part of something bigger. Everybody feels like they have something to say, and [YSU’s social media] wants them to,” she said. Harwig said YSU is that “something bigger” that followers can be a part of. “No matter where [the YSU community] goes we will always be right there and they can follow us and hang out with us, at least digitally,” she said.